A gigantic new hotel is under construction in the Manafia area of Mecca's central zone. On completion, the Hotel Abraj Kudai will be the largest hotel in the world and will include ten thousand rooms and seventy restaurants over a floor space of more than 1.4 million square meters. Five floors will be reserved permanently and exclusively for Saudi royalty. As a consequence of depressed oil prices, Saudi Arabia was obliged to introduce austerity measures which brought about a shut-down in the US$3.5 billion construction however it is looking like the project is getting under way again in the latter part of 2017. 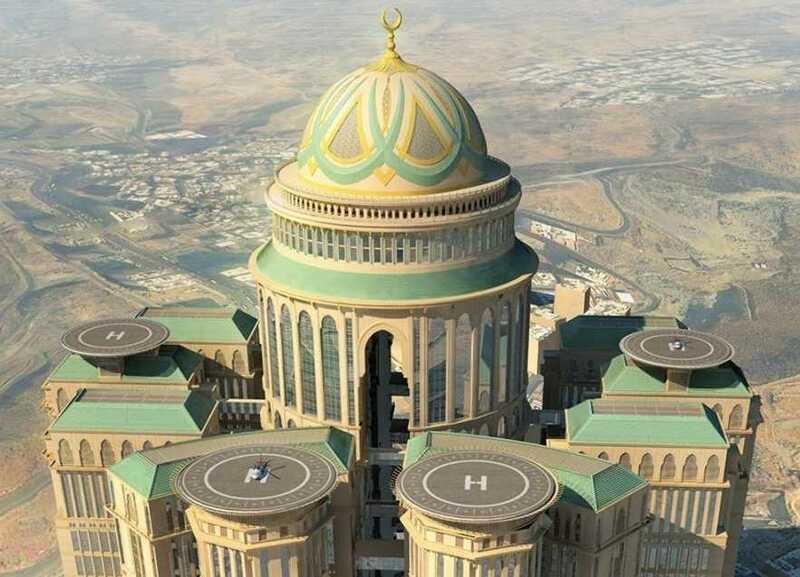 In the image of a traditional fortress, the hotel Abraj Kudai is designed in the form of a ring of twelve towers rising fourty five stories with the central tower topped with one of the world's largest domes and surrounded by five helipads. Dar Al-Handasah is an international project design, management and supervision consultancy and founding member of the fourteen member Dar Group, headquartered in Beirut and which was founded by four professors from the American University of Beirut including Kamal A. Shair in 1956. London-based design practice Areen Hospitality has been contracted to oversee the interior decorating of the huge spaces. In the same region is the Makkah Royal Clock Tower Hotel, currently the world's third tallest building and the fifth tallest freestanding structure in the world. The hotel tower is adorned with what is thought to be the world's largest clock faces which are visible from up to 30 km at night. During the annual Hajj in excess of three million pilgrims travel to Mecca but throughout the rest of the year, more than twenty million muslims visit the city. In the nearby city of Mina which is 8 km away from Mecca, more than one hundred thousand air-conditioned permanent tents have been established to provide accommodation for Hajj pilgrims. Another ongoing construction project in Mecca is the Jabal Omar development consisting of fourty residential towers which will be capable of accommodating one hundred and sixty thousand Islamic pilgrims and will also include a prayer area for two hundred thousand worshippers. Mecca's Grand Mosque is undergoing a US$50 billion expansion which will more than double the capacity of its existing prayer halls, from three million to nearly seven million. Real estate in areas adjacent to the Grand Mosque sells for up to US$18,000 per square foot. A downside of the gargantuan construction program is the demolition of heritage sites associated with historic Islam in order to make way for new construction. It is difficult to imagine that such deliberate destruction of historically significant sites would be possible in most other parts of the world and one can only assume that it is only possible in Saudi Arabia because of the Wahabi belief that idol worship is sinful.